Disintegration dei Cure is an album that has become for many the disc of life, to put on the plate when the melancholy returns, to get lost in it and let all the masks and the inhibitory brakes fall. A disintegration necessary to be reborn. In 1989 the band has many identities, but the most loyal fans always hope for a return to the dark sounds of Charlotte Sometimes, Funeral Party or One Hundred Years. The fans, who during the concerts copy the clothing and make-up of Robert Smith, are satisfied with Disintegration, an album whose title could not be more relevant. Disintegration is this: A disintegration necessary for rebirth, which starts from the celestial symphony of Plainsong up to the breaking of Disintegration, homesick homesickness and Untitled re-start, without title, without superstructures. Better than a therapy. 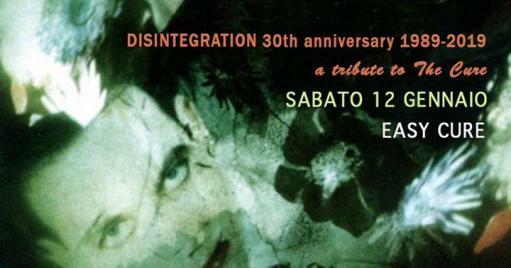 The first tribute to the Cure in Italy. Five imaginary guys, united by a strong passion for Cure, meet in Florence in the mid-90s, forming Easy Cure. From the first appearances of 1996, they have had a rapid and unexpected rise up to important performances in most of the places of national fame, proposing a unique show dedicated to the Cure. Because of its longevity, the Easy Cure tribute band has been invested with official performance by the Italian Fan Club. Over the years the live experience has left the national borders to disembark in Europe, getting to know Robert Smith and the Cure, up to receive the prestigious invitation to participate in the MTV Icon in London in 2004. Success continues with a mini tour in Turkey and other imported European gatherings of Cure fans, including England and the Netherlands.